No longer the stodgier sort of Carnegie-era library, where you might have dropped in to borrow a book or two, and perhaps looked up stock information in a book, the Cedar Rapids Public Library today is busy hub for business, civic and social meetings. 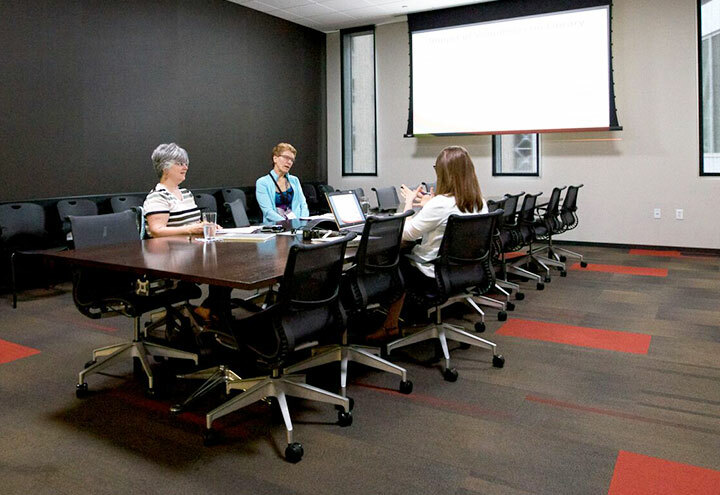 By busy, we mean people are using Library spaces by the thousands: 122,943 people used our meeting rooms in 2015. Part of the value of attracting large numbers of people to the Library is that we are also creating economic opportunities for businesses and organizations in the surrounding area. Additionally, the Library supports those businesses in a number of ways. Small businesses account for 97% of all employers in the state, and over half of all employees,* and the Library helps local entrepreneurs take their businesses to new levels by offering resources, reference expertise, access to professional databases, and amazing spaces to meet with clients and co-workers. Our larger area employers, too, have discovered our great facilities and regularly hold off-site meetings and events at the Library. We offer state-of-the-art video conferencing rooms, a 200-seat theater-style presentation auditorium overlooking Greene Square, traditional auditorium spaces that accommodate up to 150, an UnConference Room for small team pow-wows, and the Living/Learning Roof for one-of-a-kind parties and events. Literacy today is defined by more than just the ability to read. With rapid advances in technology and telecommunications, a growing amount of public business takes place online, virtually or remotely. Businesses across the board – civic, sales, service, industrial – are funneling job applicants through required online application processes as their first point of contact with potential candidates. This can be particularly challenging for applicants whose skills and expertise lie in areas other than data entry. A seasoned mechanic, for example, or a journeyman bricklayer, may be eminently qualified for a position and an excellent candidate, but may be unable to effectively wield the skill-set needed to navigate webpage after webpage of drop-down menus, radio buttons, prompts for uploading resumes, and required fields. This is the new normal for what used to be accomplished with an in-person meeting and, later, possibly a handshake. What has been dubbed the “digital divide” is very real. The Library, as a key focal point for community education, helps citizens every day bridge the gap and learn skills useful to them for not only advancing their careers, but for contributing to the overall vitality of our community.